Flobot Field makes creating an invoice easy. 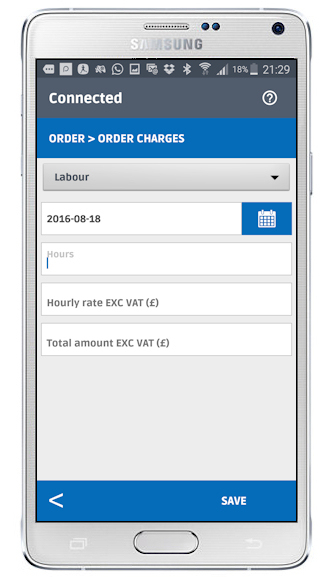 Break down the invoice into parts and labour and a pre-defined list of items if you wish, put in the quantities and Flobot calculates it all for you adding the sales tax if you charge it. So, now you have created the invoice it attaches to the job sheet and it goes off with your pictures and anything else you might have added to the the office for processing. Flobot Field comes with a nice set of pre-defined charges, such as parking, congestion charge and various certificates. But you can add whatever you like in the settings. It means you don't have to use paper invoicing anymore. No more triple-ply duplication sheets, the app can never run out of them. You don't need to speak to the office to create the invoice and you can get off to your next task. It's all about saving time. Can't get a connection? Don't panic. Flobot stores the information on your phone so you will be able to use the app even if you can't get a 3G or 4G signal. And when you do get one, it will sync with the server automatically and send the invoice off to where it belongs.